You have a business and you’re ready to find new clients in the online world. So you do what any good business owner does and you start learning about online marketing. You read book after book, take a few courses, study under a guru or two. Then its time to put all you know into action. You hire a designer to put up a website. You start up a blog. You build a profile on Facebook. You build a profile on Twitter. You build a profile on Google +. You build a profile on LinkedIn. You build a profile on Pinterest. Then you sit back and wait. And absolutely nothing happens. I know you’re thinking it, right? Unfortunately, this is the approach many small business owners take when trying to find clients in the online world. They believe the fastest way to online growth is to spread themselves out to as many sites as possible. That’s the biggest myth that exists when it comes to online marketing. I call it horizontal online marketing because your marketing plan is flat; its spread out to a variety of platforms with nothing that brings in any traction to make it work. And as you guessed, horizontal online marketing doesn’t work … unless you put the time in to make it work. Lets compare it for a moment to a heartbeat. If you have a horizontal heartbeat, things aren’t looking too good. You are flatlined. You are dead. 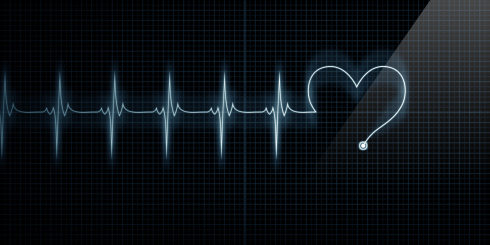 If your marketing is flatlined, it’s spread out too thin. It’s basically dead because you have nothing that brings about action and recognition. Nothing takes hold because you aren’t putting significant time into any one thing to make it work for you. You need the pulse into each effort you do to bring about the true magic. If you build a Facebook profile and leave it sit, nobody will have a reason to follow you or interact with you. If you sign up 20 of your closest friends, you may have an occasional comment or two, but the action will be too little to matter to gain traction. But if you have 20,000 friends liking your page, everything you post will have meaning. Everything you do will bring about a handful of comments. People will want to share both your content with their friends, as well as share their opinions on what you have to say. Your action will breathe life into this part of your online world. Now do the same with your blog, writing content on a weekly basis. Do the same by sharing content on your Twitter, Google + and Pinterest accounts. The key here is you only add a new site – a new beat – only when the previous one takes hold and is working for you. When you have life in one, you build the next. Your horizontal online marketing method will now have lots of “beats” to it. The horizontal line will have lots of fluctuations, giving it life on a grand scale. This is where traction comes into play. This is how to succeed in the online world.